A few nights ago my daughter was stranded at JFK airport. She had just returned from an international trip with her college. With the long overseas flight completed, all she had left was a relatively quick hop from New York to Columbus. Or so we thought. But storms had played havoc with the airline schedules that day, and after a two-hour delay and three hours of sitting on a stationary plane, her flight was cancelled. At 1:00 in the morning, she found herself in a endless line amid chaotic circumstances at the Delta counter. And called mom. Well, of course I pulled out my arsenal of tools to help her. Only problem was, that wasn’t much. A check of the airline schedules showed little availability for flights heading into the busy holiday weekend. A call to the Delta reservation line advised a wait time of over an hour before I’d get an agent. In the meantime, her line was barely moving. Then she overheard some people around her talking about rebooking on Twitter. She asked them about it, and told me to try Delta Assist on Twitter. Now I’ve had a Twitter account for awhile, but never really used it. I participated in DearMyrtles’ first Twitter/TweetDeck webinar, though, so I had a basic understanding of what to do. I logged in, searched for Delta Assist, and clicked to follow them. Then I sent them a message using the @ sign, saying, “My daughter is stranded at JFK. Can you help rebook her?” I forced myself to take a deep breath. Was I even doing this right? A few minutes later, I got a message back: “I’d be happy to try. What’s her confirmation number?” YES! Okay, another deep breath. I wrote back, the Delta agent wrote back, and within minutes we were making progress. By the time we ended our exchange, my daughter had a confirmed seat on a flight later that afternoon. She’d have to spend the next 14 hours at JFK, but she’d get home. So that’s how Twitter made a believer out of me. If it can help me in a pinch like that, I have to believe it can help me with my genealogy questions and connections as well. So I’m going to start making a little time for it in my schedule. You can find me on Twitter as “SenseofFamily” (if you follow me, I promise to follow you). It’s time for me to admit this is pretty useful technology after all. Besides, you have to agree they have the cutest corporate logo around! Just like their physical counterparts, online genealogy calculators can save time and reduce errors. Need to figure a birth date from a tombstone that gives the deceased’s date of death and age in years, months, and days? There’s a tool for that. Curious to figure out how much an estate valued at $1500 in 1870 would be worth today? No sweat. Need to find out when Whitsunday fell in 1796? (I did, to determine a death date.) Done in a flash. 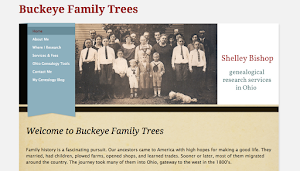 Below are some of my favorite sites offering free genealogy calculation and conversion tools. They will be the first resources listed in my new Research Tools page, which you can get to by clicking on the tab above. I’m hoping these tools will help make your research faster, easier, and more productive. I hope these will help you find some quick answers to some of your questions regarding dates, calendars, and monetary values. Happy hunting! 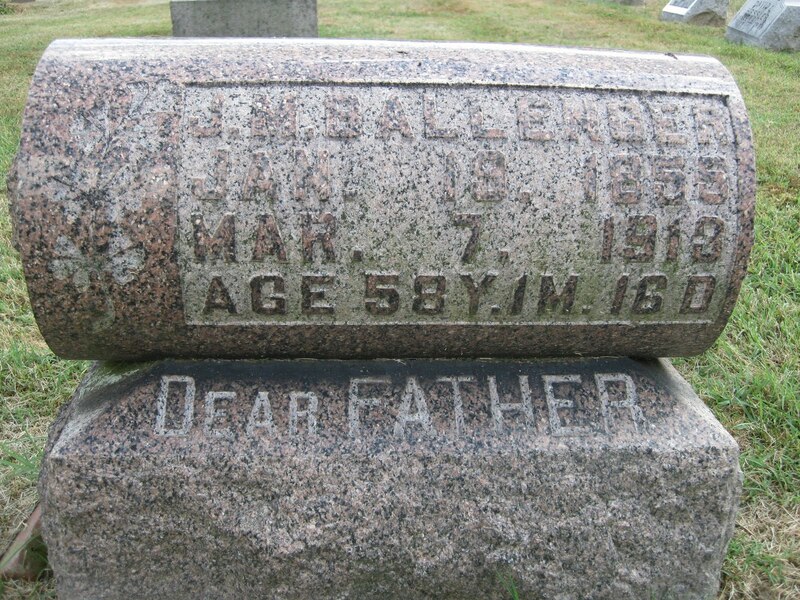 James Madison Ballenger, son of Charles and Elizabeth Ballenger, was born in Athens County, O., Jan. 19, 1858, and died at his home near Africa, March 7, 1913, being 58 years, 2 months and 16 days old. His last sickness was very brief, he having arisen as usual and after a hearty breakfast nearly completed his morning chores, when he came to the house and complained of feeling weak. In a few moments he grew rapidly worse and said to his wife, "Let me lie down to die." His last words were a prayer for divine grace and mercy to prepare him for the presence of Jesus. January 19, 1881, he married Anna Payne, who with his four children, Charles of Westerville, Clarence of Detroit, Mich., Cecil and Cyril who are at home, one brother, Charles, and four sisters, mourn his sudden death. Finds a refuge from despair. When the toils of life are o'er. Lead us in thy perfect way." The funeral was held at Mr. Ballenger's late home, where a large circle of acquaintances paid their last respects to him who so recently was one of us. Rev. Arthur Smith, pastor of the Wesleyan church at Africa, spoke briefly from Psa. 46: 1-2, after which the body was laid away in Otterbein Cemetery. We wish to thank our dear friends and neighbors for their kindness at the death of our loving father and husband, and also for the beautiful tribute of flowers. I can't imagine what Anna must have felt that day when her husband of 32 years walked in from his morning chores (she was probably in the middle of her own) and told her he needed to lie down and die. What do you say in response to that? The official cause of death on James' death certificate was "Neuralgia of heart." I found "neuralgia" defined as "severe sharp stabbing paroxysmal of pain," so to my non-medical eye it sounds like he suffered a heart attack. One new piece of information I gained from the obituary is James' middle name, Madison. All the other records I have for him only give the initial M. There are discrepancies, however, between the obituary, tombstone, and death certificate on two important points: the year of birth and the day of death. The death certificate and tombstone both say James was born in 1855, making him 58 years old in 1913. The obituary confirms he was 58 years old, but gives his year of birth as 1858 (which would make him only 55). I tend to trust the certificate and tombstone on this point. The tombstone and obituary both say he died on March 7, but the death certificate reads a scrawled March 8. I'm less sure about which is correct for this one. My next steps are to look for a probate file and funeral home record. Maybe one of them will settle the matter. Either way, it was not a good day for the Ballenger family. James M. Ballenger obituary, Public Opinion (Westerville, Ohio), 13 March 1913, p. 1 col. 5. "Ohio Deaths 1908-1953," digital image, FamilySearch (www.familysearch.org: accessed 12 May 2011), death certificate no. 14644 (1913), James M. Ballenger; citing original records of Ohio Department of Health, Ohio Historical Society, Columbus. 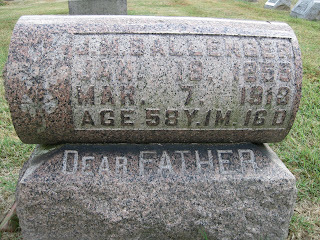 Otterbein Cemetery (Westerville, Franklin County, Ohio), J. M. Ballenger marker, section 3; personally read, 2010. 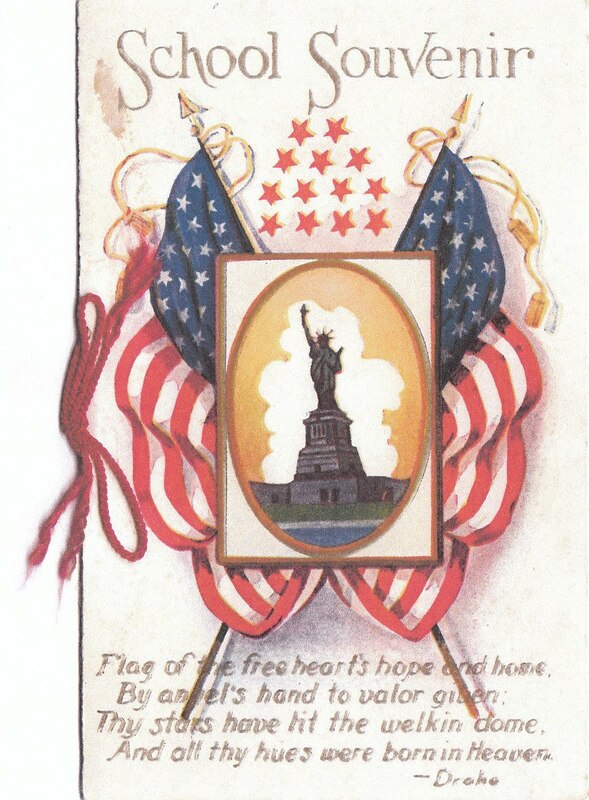 This little booklet, given to students as a souvenir of the school year when classes ended in the spring, is one of the treasures I inherited from my grandmother, Nora Eberhard Ballenger. 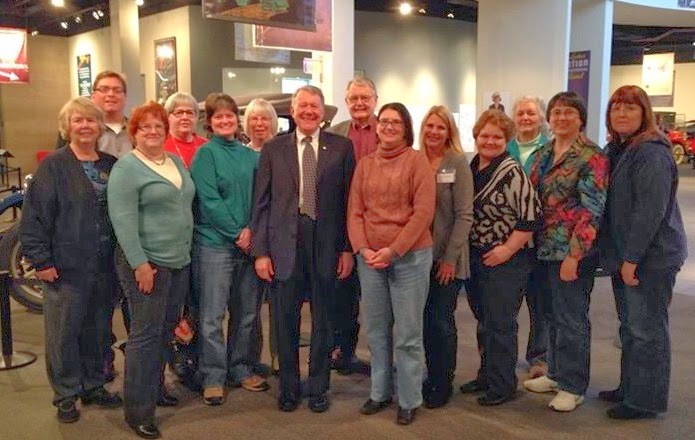 She recalled attending a one-room country schoolhouse near her family’s farm in southern Delaware County, Ohio, through fourth or fifth grade. Proudly sporting American flags and the Statue of Liberty on its cover and tied with a bit of red yarn, the booklet lists the 23 pupils and their teacher, Mr. John Cockrell, who attended Hunt School during the 1920-1921 year. Six Eberhard children—Robert, Enoch, Nora, Bertha, Carrie, and Anna—were students that year. Judging from the list of pupils, large families were not uncommon in the area. The Conway family contributed five students—Trinble, Paul, Raymond, Homer, and Mary. 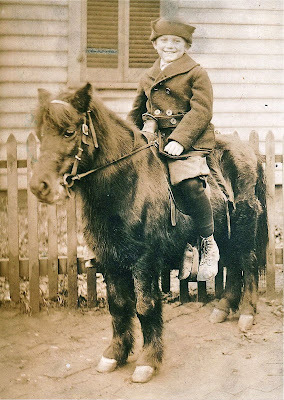 Three Fravel children—George, Earl, and Pearl—as well as Paul and Virginia Meyers, Oletha and Florence Love, Don Needels, Alva Blamer, Donald O’Brien, Grace Piper, and Mary Clapham rounded out the roster. I did go out looking for Hunt School one day in the area where the Eberhards lived, but couldn’t find it. I’ve since learned it’s been torn down. Aaron Turner has put a lot of effort into compiling a website of Old Ohio Schools, listed county-by-county with photos, location, date built, and current condition. When I contacted him regarding the school, Aaron looked into it and reported back that, unfortunately, the building had been demolished. 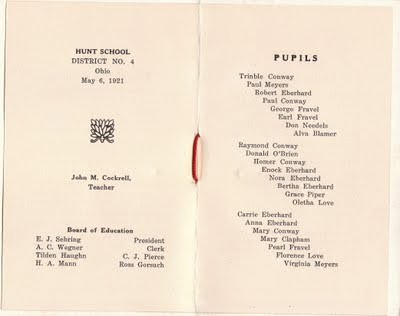 But he found a picture and offered me the chance to sponsor Hunt School in his listing for a small donation, which I was glad to do (he is adding private and one-room schools to his original database of public schools as funds permit). 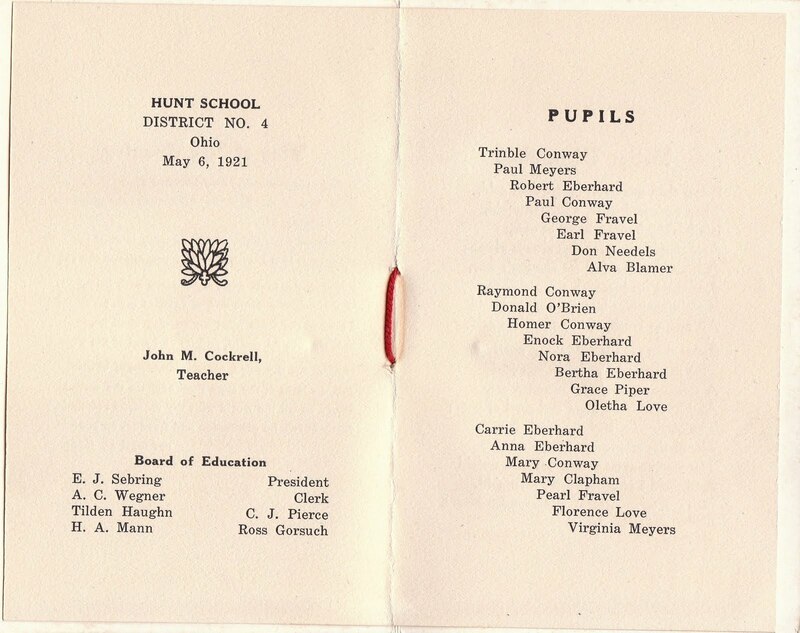 You can find the homepage of Old Ohio Schools here; click on “Delaware County” to see the faded photo of Hunt School (use your back button to return here). 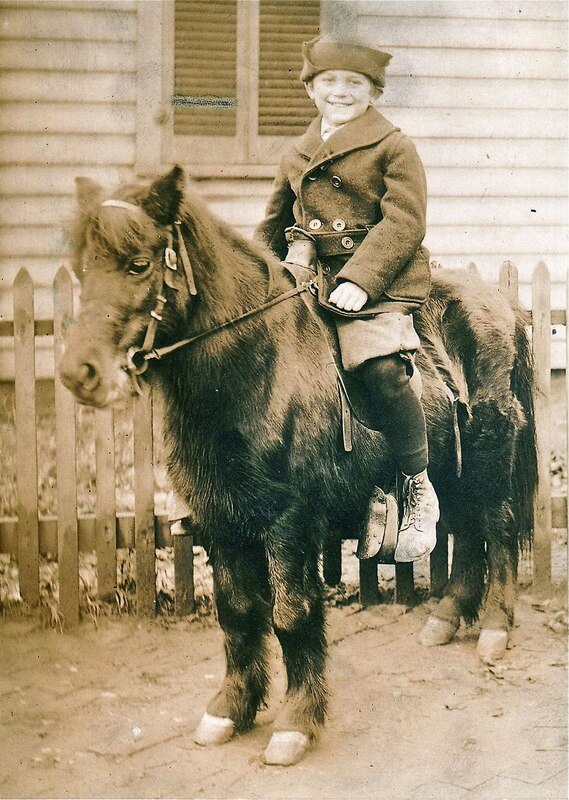 Nora attended the little one-room schoolhouse one more year. I’ll share her souvenir booklet of that year in a future post, along with some of her memories of her schoolgirl days. I never read Laura Ingalls Wilder’s books as a child. But as a mom, I read each one of them aloud to my daughter at bedtime, long after she was old enough to read them herself. It was a cozy time, sitting on her bed night after night, often continuing way past bedtime. Because we didn't read them back-to-back, it took us about three years to finish all nine books, from Little House in the Big Woods through The First Four Years. I’ll always treasure that shared experience of discovery. Many times after we stopped for the night, the chapters I had just read stayed with me, as I pondered Laura’s experiences, the extraordinary difficulties her family faced and the small happinesses of pioneer life. So I’m thinking about dropping a hint that McClure’s book would make a nice Mother’s Day gift. What about you? Do you have a memory about reading the Little House books?